Baby on tour - What I've learned. 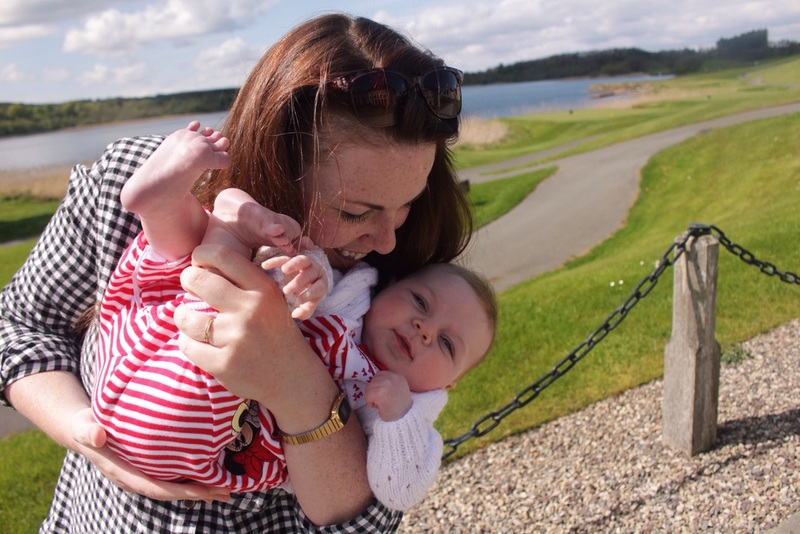 What a lot of new mums dread is that first trip and overnight stay away from home with their little one; believe me when I say that I was also one of those mamas! My Phoebe is now 5 months old and has been away from home on 3 separate occasions. Each trip came with its own set of fears, challenges and worries but equally, its own set of joys, photographs and precious memories that we will treasure for years to come! We first travelled with Phoebe when she was 3 months old. My husband and I spent a lovely few days with our daughter and my parents down in Dublin; the weather was glorious, the food delicious and the shopping was fabulous! The preparation for this trip was nothing short of almighty. I packed enough stuff for us, plus several other families. I had no idea how many nappies to bring so I packed spare ones and extra spare ones just in case. I definitely have become one of those people - the 'just in case' mum who brings everything but the kitchen sink on outings! We honestly packed a ridiculous amount for just a couple of days and we didn't need the half of it. We don't live in the dark ages ... there are shops, some are even open 24/7 (imagine that!) I really didn't need to bring the entirety of my house for a 4 day trip to Dublin! Aside from our miscalculation of 'essentials' for baby, I do feel like the overall trip went successfully. Phoebe didn't 'make strange' as some might say and she slept relatively well (snuggled in our bed mind you!!) We enjoyed beautiful, sunny walks around Dublin and a picnic lunch in St Stephen's Green. Phoebe had her first trip on the bus into the city centre and we availed of the somewhat small, but nice feeding/changing facilities in Avoca. We went bargain hunting at Kildare Village and ate yummy scones for elevenses on our last day, sitting outside in the morning sun. Phoebe generally fed well during our first trip. When it was at all possible, we tried to feed in our bedroom, keeping it nice and quiet. I was (and still am) breastfeeding on demand, so tried to stick to this as best we could. One evening Phoebe had to wait (it was only an extra 10 minutes or so) to be fed and became almost too distressed to feed, coming on and off, crying and fussing. With breastfeeding I learned very quickly that feeding my baby comes first and foremost. It's not something I'll be doing forever so I will make the necessary sacrifices so that our breastfeeding journey can be as successful as possible, even when not in our home environment. Don't worry about what others might think or even say ... you are mama and you know your baby best. After such a positive first trip, I felt more at ease for our second. This particular journey was to Co. Sligo for a big family birthday bash for my father-in-law. Phoebe was now nearing 5 months of age and very aware of her surroundings and loving her routine. Bedtime in our house is currently around 9pm; Phoebe enjoys a nice bath, Daddy dries and changes her before a last feed. We have a dummy and her teddy comforter ready in her cot, with her favourite 'night sounds' playing on the Deezer app on my iPad. Once fed, we move fast to get Phoebe to her cot: it's then dummy in, teddy nestled under her right check, music softly playing and blanket pulled up all nice and snug ... and RELAX - baby is asleep!! We have been very blessed with a baby who likes to snuggle in for her sleep at night. She goes straight down with minimal fuss and we are SO thankful. Especially after our first night in Sligo! We arrived about 9pm to a full house, a mix of adults and children who were all eager to say hello to Phoebe. We took this opportunity to unload the car and unpack a few things. Bath time followed and Phoebe was in good form. The usual routine ensued and she was dried, dressed and fed ready for bed. The room had one single bed and 2 bunks; we had debated where to have her sleep and settled on the bottom bunk bed, securing it so Phoebe couldn't roll into danger. Teddy and dummy were put in place and eyes were closed. My husband took the iPad away to set up Airbeam (we use this at home as a video monitor) so we could keep an eye on Phoebs while we spent time with everyone else in another room. I waited in the bedroom for hubby to return. Phoebe was beginning to stir and I knew she needed her familiar 'night sounds' to help her drift over into a more sound sleep. She turned and woke and instantly knew something wasn't right. This wasn't her cot, this smell wasn't home and the quietness was unusual to my baby. So she screamed ... and continued to scream for the next 2 hours solid. She was frightened and there was nothing I or my husband could do to calm or soothe her. It was an awful situation to be in. I was mad at myself, (mum guilt - I get it about everything!) I was mad at my husband for taking away her music and I was mad at the situation. We tried all we could think of: kisses, cuddles, walk around, bounce around, sing, play games, clothes off, clothes on, different position, wheel in the pram and considered taking her for a drive - yet I knew we would still have to take her back in and somehow put her to sleep!? We could hear others going to bed and all I could think of was how they would be shaking their heads saying, "poor Matt and Steph" and having to listen to our failed attempts of quietening our daughter who was in such an awful state. I will never forget those moments. Those moments when my husband and I looked at each other at a complete loss of what to do. The night ahead felt like an eternity. After much praying and trying, I snuggled into the single bed beside my daughter. I felt her wet, tear stained cheeks against mine, held onto her hand tightly and began to gently 'sssssh.' Her screams began to soften, her cries of help became sobs for comfort and her tears began to dry. As I lay, I felt a realisation of the enormity of my new role as 'mother' to Phoebe. In those moments of darkness I felt inadequate, helpless and overwhelmed by the task ahead of me and the tears began to escape. We lay for some time, sobbing together, but I thanked God in those moments and asked for His help, guidance and wisdom for the days, months and years to come. Phoebe slept for a few hours at a time that night, waking up screaming and needing soothed back to sleep. When morning came, I felt exhausted but thankful that we survived. We had votes of sympathy from family and I knew we weren't alone in our experience! We enjoyed some family time over good food, sunny walks on the beach and afternoon coffee. Phoebe even managed to catch up on the few winks she'd missed! The second evening, you can imagine my nerves as we followed our bedtime routine ... I snuggled in beside my girl, the music was playing softly and neither of us woke until morning! On waking to find that Phoebe had slept the night through I honestly felt like a large victory had been won and we had truly accomplished something great. I may even have done an air punch in celebration! Having gone through the events of the previous evening, we had an even greater appreciation for our solid 8 hours! Phoebe and I were bright and bushy tailed and we took our darling daughter up her very first mountain. We decided against the 'fine dining' experience with the little one. We wanted to be able to enjoy our meal without the pressure of worrying if Phoebe would wake and make a racket. I thoroughly enjoyed a sneaky glass of wine and a baileys liqueur coffee, knowing this would help Phoebs have a good sleep! The wee woman enjoyed a rather posh soak in a very fancy tub and went down like a dream in her travel cot. She had spent some time in it earlier in the day to help make her familiar with it. This time we made SURE she had her music playing while she dozed off! Matt and I enjoyed a luxurious nights sleep as Phoebe didn't waken until 7am for food. After feeding I snuggled her in between us and we snoozed until breakfast arrived at our door at 9.45am! I am a real breakfast person so we ordered breakfast to our room. We had a stunning lough view, so while Phoebe lay like the Queen on our bed, we stuffed ourselves silly on heavenly waffles with maple syrup and chocolate pastries in the privacy and comfort of our hotel room. The weather was kind to us and we strolled leisurely around the resort's famous Faldo Golf Course and after a relaxing swim in the pool we were ready for home. Some people say that once you have a baby you are tied down, can't go anywhere or socialise like you did pre-baby. Although this may be true for some, my husband and I are of the mindset that as long as Phoebe is happy, we can still enjoy outings etc. Yes, things are very different now with an extra little person on board but they are so much better. I am very much taking things one day at a time and enjoying the learning curve we are on. Hindsight is a wonderful thing and mistakes should be used to help us grow, learn and mature into stronger and better parents. My advice is to take baby away. It's good for them to experience new sights, sounds and surroundings, but stick close to your routine when possible. They like predictability as it is definitely a comfort to them. You know your little one so don't be afraid to do what you feel necessary to make your life and their little life easier while you are away. And although the packing, unpacking and washing is a PAIN, don't be put off by taking baby on a trip and ENJOY!